The pilots of Northwest Flight 188 were "disengaged and impervious" to the danger they put the plane in, the FAA says. Washington (CNN) -- The Federal Aviation Administration revoked the licenses of two Northwest Airlines pilots Tuesday in an extraordinary letter in which the agency chastised the pair, saying they endangered the public by flying an hour and half without contacting controllers "while you were on a frolic of your own." The letter to Northwest Captain Timothy B. Cheney and First Officer Richard I. Cole puts the total time the pilots maintained radio silence at 91 minutes -- 13 minutes longer than originally defined by federal investigators. The letter said the pilots were "extremely reckless." "Not only did you not comply with ... [air traffic controller] instructions, you did not even monitor the aircraft's air-ground radios," the letter said. "You were disengaged and impervious to the serious threat to your own safety, as well as the safety of people for whom you are responsible. This is a total dereliction and disregard for your duties." The letter provides new details about the flight. Cheney, 53, and Cole, 54, were piloting Flight 188 from San Diego, California, to the Minneapolis-St. Paul airport in Minnesota on Wednesday when air traffic controllers lost radio contact with the Airbus A320 over the Denver, Colorado, area. Video: How can pilots forget to land? At 8:14 p.m. CT -- 36 minutes after the plane was to begin its descent and 14 minutes after its scheduled arrival -- the pilots contacted controllers, the FAA said. One of the pilots radioed: "We got distracted and we've overflown MSP [Minneapolis-St. Paul airport]. We are overhead EAU [Eau Claire, Wisconsin] and would like to make a 180 and to [make] an arrival from over EAU." Cheney and Cole told federal investigators that they "lost track of time" while working on personal laptop computers, the National Transportation Safety Board said. They became aware of their plane's position only after a flight attendant asked about the landing time, according to the NTSB. The FAA said the revocations cite several violations of regulations, including failure to comply with air traffic control and clearances and operating carelessly and recklessly. The pilots have 10 days to appeal the revocations, which are effective immediately, to the NTSB, the FAA said. Flight 188 carried 144 passengers, the two pilots and three flight attendants. Cheney was hired in 1985 and has more than 20,000 hours of flight time, while Cole was hired in 1997 and has about 11,000 hours of flight time, according to an NTSB report released Monday. Neither pilot reported having had an accident, incident or violation, neither had any ongoing medical conditions, and neither said he was tired, the report said. They each had had a 19-hour layover in San Diego; neither said he had slept or argued during the flight, but both said "there was a distraction" in the cockpit, according to the report. Neither pilot said he noticed messages sent by company dispatchers, the report added. 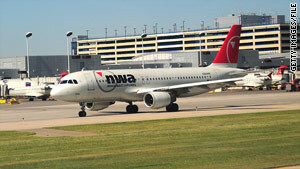 It said the men were talking about a new monthly crew flight scheduling system that was put into place in the wake of Northwest's merger with Delta Air Lines. "Each pilot accessed and used his personal laptop computer while they discussed the airline crew flight scheduling procedure," the report said. "The first officer, who was more familiar with the procedure, was providing instruction to the captain." After landing at the Minneapolis-St. Paul airport, both voluntarily underwent alcohol breath tests, which proved negative, the report said.